Nikon | Imaging Products | Best of the Rest / Nikon Family Cousins, Part 14 : "Nikon FA" and "Nikon FE2"
Home > Products & Support > Imaging Products > History > Camera Chronicle > Part 14 : "Nikon FA" and "Nikon FE2"
Part 14 : "Nikon FA" and "Nikon FE2"
It was around the end of 1977 when Nippon Kogaku K.K. (present Nikon Corporation) started two project teams mainly formed of Camera Designing Dept. (of that time). The one was the team for developing a high-speed shutter mentioned in the previous part (Nikon FM2) and the other was the team for "Matrix metering" incorporated in Nikon FA to be mentioned in this part. Nippon Kogaku had been concentrating its effort on the development of technologies for the exposure meter and exposure controlling. The effort was resulted in the center-weighted metering system, the standard of the TTL metering and the TTL-AE of Nikomat (named Nikkormat in some countries other than Japan(Nippon)) EL series, Nikon EL2 and Nikon FE. However, there is no "end" in the world of exposure control. In spite of endeavoring numerous means to advance the accuracy of exposure control and to minimize the failure, we cannot reach the stage of perfection. For example, though it is possible to advance 96 % of success of the past to 98 %, 98 % to 99.5 %, but it is no way possible to attain 100 % of success. To avoid a few percent of the remaining failure, advanced users will utilize the exposure compensation or auto exposure lock. Then what about the not-advanced people ? "Making the exposure compensation or AE lock operation unnecessary", was the object of this team. The project team launched with about ten staff members in total, formed mainly of engineers in charge of metering mechanism and a few of engineers in charge of evaluation. The team started the development with analyzing the relationship between the brightness distribution of the subject image and the optimum exposure. A substrate of space of 24 x 36 mm corresponding to a full format of 35 mm (135) format film, on which 24 SPD ( Silicon Photo Diode) chips of 5 mm square were arranged, 4 in vertical and 6 in horizontal, is fixed in place of the film pressure plate of the Nikon FE body. Output signals from 24 SPD's are amplified by the same IC for metering as is used in the FE, and are transmitted by an analog switch to a pen recorder in a time series. It was a device to measure the information on the brightness of the subject in each area of 24-segmented image plane, by interpreting the graphic output produced on paper by this pen recorder. At present this is processed with a personal computer in the way that the output signal of the metering device is input as a database by means of an A/D (analog-to-digital) converter, but in those days, it was processed in entirely "analog" manner. They took pictures of various scenes in various situations by an FE equipped with such a device and an ordinary FE arranged side by side. An ordinary FE was, of course, loaded with film and the shooting was made with bracketing (multiple shots at different exposure settings) bit by bit. They were developing the algorithm (a method of solving a problem) with which more optimum exposure can be got, with comparing the frames considered as "optimum exposure" selected from thousands of rolls of film taken that way with the graphic output from the 24 SPD's. (2.) segments of the frame into five areas would be satisfactory for practical use. As a next step, they actually made SPD prototypes capable of metering with 5-segmented image plane, and tested them which were incorporated into the FE body. Further, they took pictures of variety of scenes as far as they can imagine, and repeated the brush up of the algorithm by analyzing the results of them. As a matter of course, staff members went to many spots of the world to collect the data of other than Japan that is located in the mild temperate zone. 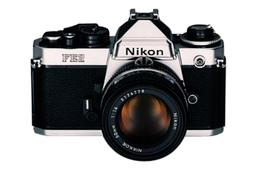 Before the world first "Matrix metering" was completed and incorporated into Nikon FA which was released in September 1983, six years and the efforts of many people involved in the project were required. Nikon FA was planned to incorporate "Matrix metering" and "Multi-mode AE" into the FE body. Regarding "Multi-mode AE", Programmed AE [P] mode with instant stop-down metering which was already carried out with Nikon FG (1982: refer to Part 12.) was adopted and further, Shutter-priority AE mode [S] was added. And the high-speed shutter with the top speed of 1/4,000 sec. realized in Nikon FM2 (1982 : refer to Part 13.) was incorporated with a modification to the electronic control type with faster flash synch speed of 1/250 sec. However, in order to add these new functions, some other things were obliged to compromise. Especially, AE lock seemed to be a complicated one due to the adoption of the instant stop-down metering, so they decided to omit it as "Matrix metering" was introduced. Further, with the stop-down metering, due to the limit of metering capacity, the speed control of the slow shutter was restricted. In relation to this, manual shutter speeds exceeding 1 sec. were omitted. Six months before the release of Nikon FA, Nikon FE2 was released. The succeeding model of the FE turned out to be the FE2, but the original plan was that the later FA was to be FE2, the succeeding model of the FE. The succeeding model of the FE was naturally to be equipped with 1/4,000 sec. shutter, and TTL flash control of the dedicated Speedlight but as it was further piled up with new functions, like Multi-mode AE, its cost went up and became not paying with the former price range of the FE. In addition, above-mentioned compromises of specifications were obliged to make, its characteristics deviated from the succeeding model of the FE. So a camera with 1/4,000 sec. electronic control shutter and TTL flash control of a dedicated Speedlight simply added to the FE was planned and developed, and it was released as the FE2 (Photo: below left). That seems to be the fact. Nikon FA was awarded the first "Camera Grand Prix" as its state-of-the-art Matrix metering technology was rightly appreciated. This prize is awarded to a specially excellent camera elected out of the cameras released in that year by the panel of judges consisting of editors of camera magazines and critiques. In the memorial first year's award, Nikon FA and OLYMPUS OM-4 were running neck-and-neck, and that is a topic of everybody's lips in the industry even today. Both carried out the technical innovation of exposure control, but their ideas were quite contrary to each other. Matrix metering of Nikon FA is the technology aiming to minimize user's judgment of the exposure compensation, by analysis of the delicate brightness of the subject, it is, as it were, a decision-free technology. On the other hand, Multi-spot metering of the OM-4 is the technology to cope with user's intentions by accepting user's judgments as many as possible. Nikon FA won the prize in "Camera Grand Prix" by a very slim margin, which, in retrospect, is a natural consequence. The technology of Matrix metering has evolved to 3D color matrix metering of Nikon F5 and Nikon Digital SLR Camera D1 and in the flash photography, 3D multi-sensor balanced flash control, and other makers adopt the similar multi-segment metering technology in various names of their own. Multi-spot metering is utilized in the technology for separate exposure meters, but not for the control of camera-integral exposure meter. The technological value of "Matrix metering" is proven by the history. 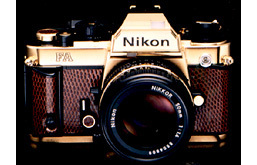 In commemoration of winning the "Camera Grand Prix" prize, Nikon FA Gold was released in Japan (Nippon). This was based on the FA, and its silver color parts such as top and bottom covers are gold-plated and the lizard skin was used for leather cover. It was a limited edition housed in the box of paulownia wood and priced at 500,000- Japanese Yen, even the coupling ring of the barrel of AI Nikkor 50 mmf/1.4 normal lens attached was gold-plated and Nikon logotype on its lens cap was also gold-plated ......such an elaborate work. Nippon Kogaku had made so far gold-plated cameras in small quantity which were used for commemorative gifts to dealers, but the FA Gold was the first gold-plated model that was for sale. It is a little-known episode that they asked jeweler's advice about the maintenance of the gold-plated part before the start of the sale.